Tonight on NBC their new show RUNNING WITH BEAR GRYLLS airs with an all new episode. On tonight’s episode called, “Tamron Hall” Tamron Hall and Bear explore the remote desert of Utah, where they connect with an unusual friend. On the last episode world-renowned survivalist Bear Grylls (“Get Out Alive with Bear Grylls,” “Man vs. Wild”) took Tom Arnold (“Sons of Anarchy”) through the unpredictable coastal mountains of Oregon, taking on steep terrain, river crossings and oceanside cliffs. Arnold attempted to channel the courage and determination from his weight-loss struggle in order to tackle a journey that took him to the brink of mental and physical exhaustion. Did you watch the last episode? If you missed it we have a full and detailed recap, right here for you. 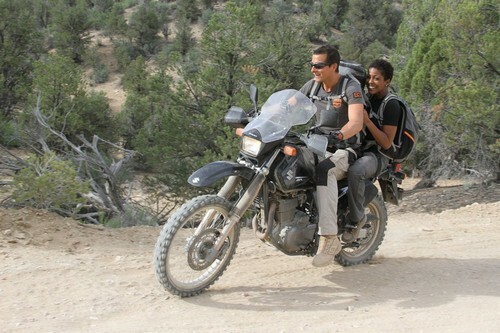 On tonight’s episode world-renowned survivalist Bear Grylls (“Get Out Alive with Bear Grylls,” “Man vs. Wild”) spends two days in the remote Utah desert with Tamron Hall (“The Today show”) getting to know the depths of her personal tragedies and triumphs of her life, while challenging her along the way. Hall makes small talk with an unlikely friend in the wild and later struggles when she finds him on her dinner plate. RECAP: Tonight Tamron Hall is going to enter the wild with Bear, she was driving through the desert to reach a place where she is to meet Bear; she sees a helicopter in the sky and it’s Bear standing on the side of it. Tamron gs on the helicopter and the two are now flying in the air, Bear tells her to hold on and the she shouldn’t look down whatsoever. The two get off on top of a mountain by rappelling off the helicopter to the ground, they are going to climb down a mountain on day one to their camp and then into a deep canyon to the extraction zone. Tamron explains being boring in Texas, he family were fishers and hunters; though it was more of an educational puruse for her. She has always lived in the city, though wanted to once go ahead and experience the wild. They are going to go down the cliff right now; if Tamron falls then Bear can jump off the other side to save her if she falls. Tamron is very nervous and knows she can’t go back. Tamron is walking and almost slips; she starts to slide down a little bit. Tamron is terrified of the terrain and finds it hard to walk, she has a tattoo of Texas on her right hip because of her love for her state; Bear goes ahead and throws a rope off the side of the cliff to go even steeper.Bear is going down ahead of her, though she can’t believe how fast Bear is going down; seeing him get farther away kind of made her feel really anxious. Tamron starts going down now and is really not sure what she is doing, she is really scared and anxious; Bear is pulling her down but she says to stop. She’s really not comfortable right now, Bear tells her it’s okay and that she can go down bit by bit. Tamron is doing her best to go down the side, but she is so scared; it was the toughest thing she has ever done. Bear helps her down and she isn’t sure how she possibly did it; the two then walk down the rest of the cliff. Tamron is a little confident now and talks about being a reporter in Chicago; though was the first African American to be on the Today Show. She then talks about her sister being murdered, the details are unclear; though she was in a violent relationship. Tamron realizes how much you open up being out here in the wild, Bear finds a dead squirrel and sees it’s fresh; it’s exactly what he wants for dinner tonight. Bear goes ahead to gut the squirrel and Tamron says he is nuts; Tamron goes ahead and starts to cut the squirrel though is finding it hard. Bear guts it for her and puts it in her backpack; she is horrified by this. They have food and now are going to find a place to set camp; Bear finds a little place in some trees and set up a hammock. Bear pulls out the squirrel and roasts it over the fire; Bear mentions this is a nice date. Tamron replies that it would surely be the last if it was, Beat starts to eat his squirrel and likes it. Tamron takes a bite and says it’s not good but not bad. Bear asks about how it must have been after her sister passed; Tamron mentions that it changed her life a lot. Bear mentions he lost his dad at 25, it made him feel so out of control; it was completely made him lost and had to grow up fast. Tamron talks at night on the camera and can’t believe how sore she is from her long day. There is so much smoke being brought from the fire in the morning, it wakes up Tamron comletely; she then starts to follow him. Bear knows she is beat up right now after yesterday, he tells Tamron they have to get across this massive canyon. Tamron said that looking down the cliff made her feel so nervous; she can’t believe they have to rappell down it now. Bear and Tamron are going down together; Tamron says it’s the biggest combination of her fears. Tamron looks down and starts to freak out a bit, she’s truly scared. Tamron’s legs are shaking and she is sweating a lot, Bear starts going down much slower with her; right at the end he jumps down to the ground and Tamron is so happy to hit the bottom. Bear is proud of her for doing this, he could feel her shaking in fear. Tamron says this is one of the most amazing experience of her life, she loves getting this bit of down time; it helped her completely detach from her life and worries. Bear and Tamron go down the trail to a motorcycle, Bear gets on and Tamron hops on; the two then drive off.